What began as a dream 15 years ago – when David Greaves helped establish an Israeli presence in the bobsled and skeleton world – finally received the approval, recognition and support of the Israeli Olympic Committee this past December. Greaves was a member of the Israeli bobsled team that fell short of qualifying for the Olympics in 2006, although they did compete in two world championships. I felt I wanted to continue in some capacity,” Greaves told the Independent in an interview earlier this year. “So, I took over as head of the federation, of which I’m now the president. It’s called Bobsled Skeleton Israel, which is the Israeli bobsled skeleton federation. The experience changed the trajectory of Greaves’ life – he was working in the sales and high-tech industry. It also made him realize what was important for him as a Jew and an Israeli. Greaves spent 10 years fundraising for Winnipeg’s federation and then for the Jewish Foundation of Manitoba, before starting his own business in 2014. Called Protexia, it helps nonprofits and charitable organizations fundraise. With the refocus in his professional life also came a refocus in his involvement with Bobsled Skeleton Israel. As the organization’s volunteer president, he is in regular contact with the Israeli Olympic Committee as they gear up for the Winter Olympics in PyeongChang, South Korea, in 2018. 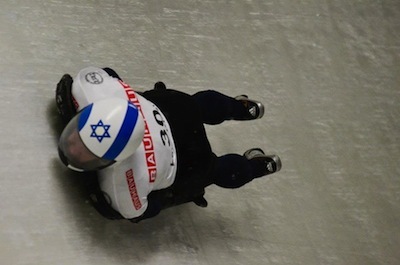 While many people compete for Israel from around the world, most are not directly connected to the Israeli Olympic Committee, but, with the completion of the process in December, Bobsled Skeleton Israel is now an official Olympic sport under its umbrella. Last September, the committee had accepted Greaves’ recommendation to recognize the criteria established by the International Bobsled and Skeleton Federation as the Israeli criteria. “It was almost anticlimactic,” said Greaves. “I was working on this for 13 years and I’d never had the opportunity to present to the Israeli Olympic Committee before, with the opportunity of them possibly accepting our recommendation. Needless to say, I was over the moon and ecstatic. To get to the Olympics, the athletes will need to be in the top 60 internationally. For the current season, the goal is to get two athletes into the top 75 world ranking, which would position them for next year. They currently only have one. All of the Israeli athletes in the federation are competing on their own in skeleton. Bobsled Skeleton Israel is a nonprofit in the United States, enabling them to fundraise there for their athletes. These athletes can fundraise within their circles and the organization can provide a tax receipt to donors. “We’ve been pretty successful in the last few years in raising more money than we have in the past,” said Greaves. “It’s been allocated out to the athletes based on need. Essentially, they get reimbursed, in very small part, for their costs. If we have $5,000 or $10,000 in the bank, so to speak, and an athlete has just come back from a week of training, then they can submit a portion of their expenses. But, it’s very modest. In that case, the athlete will be eligible for a few Israeli shekels a month. Even so, about 95% of the money spent in this sport by Israeli athletes is money that they themselves have raised, either through their own personal supporters or their own savings. According to Greaves, his athletes have given up the last two or three years of their lives to compete and train. Contributions are deductible in Israel and the United States, and there is an Indiegogo campaign currently underway. Greaves is in discussion with a few Jewish organizations with the hope that they may be able to assist in accepting Canadian donations. “We want people to understand we’re in this because of a love for Israel and a love for sport,” he said. “Our ultimate dream is to walk into the Olympic stadium with the Israeli flag. There’s such a pride that’s hard to convey. We do this out of a sense of pride and love for Israel. For more information and to follow the athletes – Bradley Chalupski, Adam (A.J.) Edelman, Joel Seligstein and Larry Sidney – visit facebook.com/israelibobsledandskeletonfederation. To contact Greaves, email [email protected].